Scotland's largest building society is to be put up for sale by the government after it effectively collapsed with a massive loss. It had been hoped the Dunfermline could continue with a government bailout of between £60m and £100m. But the regulators have decided it is no longer viable, with a £26m loss expected to be announced next week. Prime Minister Gordon Brown insisted savers' deposits would be protected but rejected a taxpayer-funded bailout. The Scottish government said it was "deeply disappointed" it could not continue as a going concern. The tri-partite regulators - the Bank of England, the Financial Services Authority (FSA) and the UK government - have forced the sale of the Dunfermline, after it emerged a multi-million pound loss was expected and further problems were likely to emerge. Mr Brown said: "Let me just repeat the promise I made to people before that savers will be protected, that it's important to recognise that throughout this whole crisis that everyone who's been saving in a UK institution has been protected, whenever there has been a difficulty in that institution." BBC Scotland business editor Douglas Fraser, who broke the story, said the regulators believed a bailout would have only delayed a forced sale. He said a key problem was the building society's exposure to risky assets, after it lost more than £9m in its own IT business and it bought mortgage securities from two troubled American finance houses, GMAC and a subsidiary of Lehman Brothers. The building society could be broken up in the same way as the Bradford and Bingley, which saw Spanish bank Santander taking over its savings accounts and branches, and the government taking temporary control of its mortgages and loans. 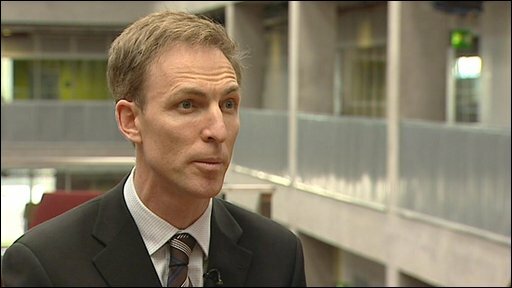 Secretary of State for Scotland, Jim Murphy, said bad management decisions had "jeopardised the Dunfermline's entire future" and a bailout would be unsustainable. He said: "The Dunfermline has suffered partly because of the crisis in the international economic situation. "But also by some reckless decisions by previous management because of over-exposure to commercial loans, involvement in the subprime mortgage market in the US and really bad decisions on their technology. "We're acting to make sure there's stability to protect savers and to do as much as we can to save jobs and branches." He said the government was looking at the Bradford and Bingley model. "The options include the government intervening to underwrite some of the toxic debts and other commercial organisations becoming involved, perhaps some other building societies," he said. "If there was a standard bailout that we've seen in other situations there's a real worry that the Dunfermline couldn't actually service the debt." The building society employs nearly 500 people, half at its headquarters in Fife and half in the network of 34 branches. Labour MSP for Dunfermline East, Helen Eadie, said many of her constituents were worried. "A top priority for my constituents is the jobs. There's a lot of anxiety understandably and that will be my priority over the coming weeks, to address the concerns of people who have jobs, the social housing, the investors," she said. First Minister Alex Salmond said the Scottish government had offered a capital contribution to help maintain the Dunfermline as an independent and ongoing concern, and to provide guarantees that would protect its role in lending for social housing in Scotland. He said: "That offer remains on the table, but it does require Treasury approval. "We welcome the indications that social housing finance is also a priority of the Treasury, but are deeply disappointed that the Treasury now believe it is not possible to sustain the society as an independent institution, given the importance to Scotland of HQ jobs and functions. 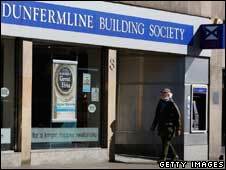 "We hope that the Treasury has not closed its mind to the idea that both in terms of employment, and in terms of value for money for the public purse, maintaining Dunfermline Building Society as an independent and ongoing concern could well be the strongest option, and in the interests of its members and depositors." Will building societies stop lending?